Tune into The Cooking Channel tonight at 9PM EDT to see my buddy, and grill girl herself, Robyn Medlin, in a BBQ and grilling episode of Food(ography). I've interacted online with Robyn for quite a while and we finally met this past March at Kingsford University. She brings a fun, young, vibrant and decidedly welcome female vibe to an otherwise male-dominated avocation. To that end she conducts women-only clinics to help the ladies overcome the fear of the flame. Tune in, and I think you'll see what I mean. 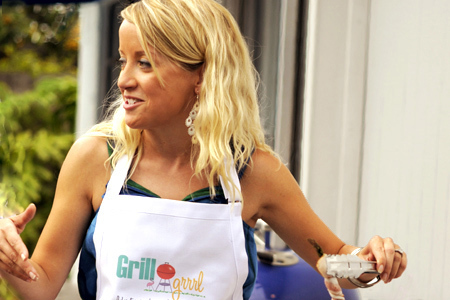 Oh, and be sure to check out her site for some great recipes and grilling info. I thought Robyn came across very well in the episode. Always good to see BBQ folks getting press and coverage.